The United States Geological Survey reports a preliminary magnitude 4.1 earthquake struck near Alum Rock, California on Monday. The quake hit at 4:53 PM local time at a depth of 7 kilometers. Residents as far away as San Francisco reported feeling the quake. Between the seismic activity and a litany of wildfires still burning in wine country, Monday was a dramatic day for Northern Californian weather. Locals took to Twitter to vent their fear and disbelief. That 4.4 earthquake rocked our house pretty hard for about 10 secs here in the Blossom Valley area in San Jose. Biggest I’ve felt in years. There was no initial word on damage or injury resulting from the quake. More information on this earthquake is available on the USGS event page, and you can see more USGS quake alerts, report feeling earthquake activity and tour interactive fault maps in the earthquake section. 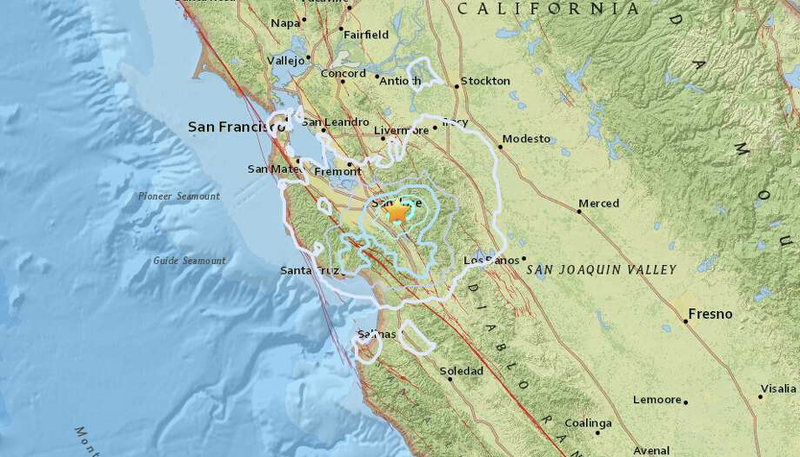 An earthquake with preliminary magnitude of 4.1 struck near San Jose on Monday, Oct. 9.